· Defence - has bactericidal and fungicidal properties, as existing ammonifying bacteria in it suppress the decay and pathogenic microflora of plants and soil, increases the resistance of plants to different diseases such as late blight, scab, viral diseases. Based on the above mentioned functions, we can make a conclusion that the use of the preparation “Georganic” gives us the opportunity to avoid turnover of seeds, to obtain ecologically clean products with high gustatory and nutritional values in all soil and climatic conditions. The preparation “Georganic” is a concentrated blend of biologically active substances, which are balanced by minerals and bacterial cultures. Active ingredients of the preparation “Georganic” are humic, fulvic and other organic acids, trace elements and bacteria, the cultivation of which occurs with strains of pure cultures of ammonifying bacteria. Each of selected culture of ammonifying bacteria is distinguished by its unique physicochemical and useful properties. They are the decomposers of biologically active substances and play an important role in the process of circulation of substances occurring in nature. The preparation “Georganic” has bactericidal and fungicidal properties, as existing ammonifying bacterias in it in the course of their life create bacterial mass, the soil to suppress the decay of plants and pathogenic microflora both in the open grounds and in glass-covered grounds, etc. In addition, these bacteria enhance the resistance of plants and soil against diseases such as buck eye rot, fusarium blight, rotting of any kind, clubroot of cabbage and other viral diseases. · Root feeding by “Georganic” preparation provides optimal growth and development of plants (that is, performs the role of a natural growth regulator), which leads to increase productivity and to reduce the time of ripening. Along with this, eliminates the spread of diseases causing decay of the soil and plants. · The preparation “Georganic” gives the best results, not only in rooting agricultural but also decorative cultures. The preparation can be used by both professional and amateur. The preparation speeds up the timing of adjustment of plants to new conditions and helps the development of root systems of plants. · The preparation “Georganic” is also effective for cultivation of houseplants: most houseplants have a positive perception of feeding the root by the specified preparation. · The preparation “Georganic” slows the movement of sand through the creation of humus horizon in the deep layers, as in the case of the plant root system deep spreading to stop sand movement, that gives the possibility of creating not only the time horizon, but also to improve plants stability and activity to the sand environment. · Increase drought tolerance and yield of agricultural plants. In conditions of high concentration of organic acids the volume of water and soil aeration increase occures, it improves the moisture capacity of the soil that promote plant development. 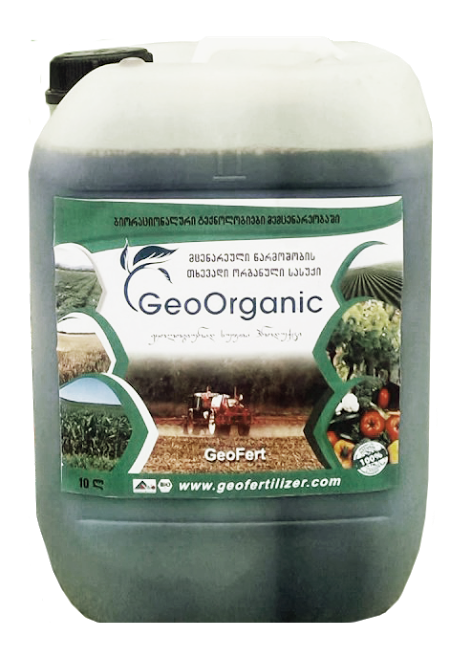 Organic acids complex, minerals and ammonifying bacteria promotes the growth of root systems of plants to 1,7-2,5, that allows the roots to penetrate deeper into the soil and use moisture and as a result the plants need less watering. · Reduce background radiation, contributing to increased ecological properties of the soil. · Return of degraded soils in agricultural use. Based on the foregoing, we note that the organic substances in the soil are the primary nutritional elements for plants. Soil microorganisms decompose the humic substances, supply the plant with food elements in the form of minerals. Organic acids, trace elements and ammonifying bacteria included in “Georganic” significantly affect soil properties, plant development, improve the physicochemical and biological properties of the soil. Stimulate the growth and development of plants, inhibit toxic substances and radionuclides and as a result contribute to the receipt of ecologically pure bio products. “Georganic” with its unique properties can in the shortest time solve the issue of food supply and environmental security not only in a particular region and country, because the preparation can be used in all soil and climatic conditions for all soils and plants.